Photo by Dwight Duhn. 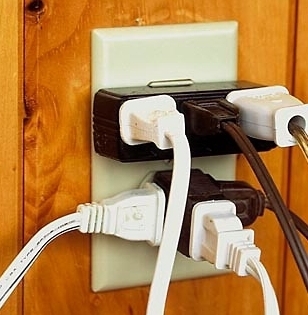 If you need more electrical outlets, add them right away. Turn this off at the wall plate and don't run it until it's repaired. The next thing you want to check for is light fixtures. First, make sure that the ceiling-mounted fixtures are secure, and then check the wattage and bulbs. It’s possible that the former owners put a higher wattage bulb in their light fixtures than they were safely designed to handle. (Realtor’s trick: brightly lit homes sell faster.) It only takes a few minutes to make sure this is not the case. Do you like the fixtures? What about ceiling fans? Under counter lighting in the kitchen is always a great value.